This advertisement for the new Alta Lofts in Lincoln Heights was spotted in the March 8, 2010 issue of the Los Angeles Downtown News. These new adaptive reuse lofts, once a warehouse for the Fuller Paint Company, are situated a half-mile from the Lincoln Heights/Cypress Park Gold Line Station. 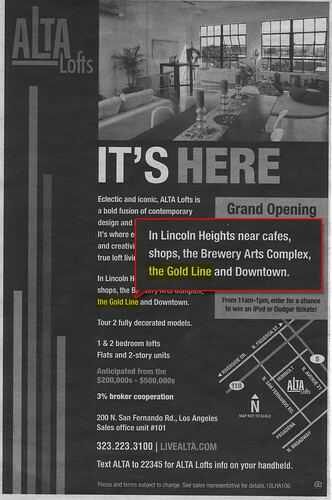 The Alta Lofts sales team smartly chose to include this information as a selling point in this print ad as well as on the interactive map on their website. 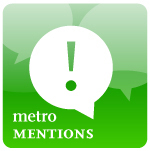 What’s it mean to be so close to the Lincoln Heights/Cypress Park station for prospective buyers? It means Alta Lofts residents will be a five minute ride from Union Station and all its transit connections, a seventeen minute ride from the shops and entertainment of Old Town Pasadena, and a eight minute ride from the great food and cultural sights in Little Tokyo.